Two months ago Alyaksandr Lukashenka ordered to find more oil deposits in Belarus. He was visibly upset that his country did not have enough of its own oil and had to depend on Russia. After all, oil revenues help many authoritarian regimes to stay afloat for decades. So far Belarusian geologists failed to discover new oil deposits in Belarus. Oil imports from Russia become increasingly expensive. For over a decade, refining cheap Russian oil and selling oil products to the West has been a cornerstone of the Belarusian economy. Now Belarus has to share a large part of its oil profits with Russia. Still, exporting oil products remains a lucrative business. With budget revenues dwindling the authorities are trying to seal Belarus Western borders to impose a state monopoly on reselling oil products to the West. These export restrictions and increased gasoline prices make many Belarusians angry. Last week hundreds of cars blocked the center of Minsk. Motorists were demanding lower gasoline prices. Although the authorities subsequently imposed fines on the most active protesters, Lukashenka backed down on the next day and ordered to lower gasoline prices. The protesters enjoyed wide support of the public who helped to raise several kilograms of Belarusian money to pay the fines. A few days later, gasoline-related protests erupted in other parts of the country. New restrictions on gasoline exports by shuttle traders caused the protests. It is no longer possible to frequently travel abroad with a full tank of gasoline. Angered by that, shuttle traders blocked the border crossing on the Polish-Belarusian border near Hrodna for several hours. Police had to disperse the crowd using tear gas. They also detained over a dozen of protesters and sentenced them to large fines. The authorities also deprived fifteen protesters of the right to travel abroad for a year. Most of those people were shuttle traders who made their living by cross-border trade. A similar accident occurred not far from Brest at the Varshauski Most border crossing. Around 100 people gathered at the Belarus-Poland border and demanded to cancel quotas on gasoline exports. There police did not have to use force and the protesters left after talking to the head of the administration of the Brest region. There is more illicit cross-border gasoline trade. The state news agency Belta reported that a hand-made pipeline was constructed underground to link Belarus with an unnamed neighboring Baltic state. Belarusian smugglers pumped oil products through that pipeline. Belarusian KGB vowed to punish the smugglers and currently investigates the pipeline construction. The government is also tightening export restrictions on other goods. Heavily subsidized state enterprises often produce cheaper goods compared to foreign equivalents. Consumers in other countries like it. In the past, when economic subsidies from Russia were more generous it was not a big deal. But today the government completely banned exports of pastas, refrigerators, gas stoves, cement and other goods. These measures puzzle analysts because while Belarus can control exports to the European Union and Ukraine, the border with Russia remains open. This is where most of Belarusian goods, besides oil products, end up going. Sviatlana Kalinkina observed in Narodnaya Volya that Belarusians were buying in Lithuania all they could: cheese, coffee, washing powder, butter, construction materials. The Lithuanians are happy to see the surging demand for what they sell and offer Belarusians discount cards. Belarus, on the contrary, imposed harsh export restrictions on nearly everything it produces. This shows how unhealthy the Belarusian economy is. 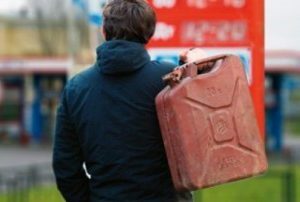 It will take more than reduction of gasoline prices to cure the economy and appease Belarusians. Belarus' economy needs external financing more then ever before. The government resists privatization but it will have to surrender soon, even if the International Monetary Fund decides to extend another loan. Recently the Belarusian weekly Belorusski Rynok discussed the chances of getting an IMF loan. At least three factors play against it. First, Belarus failed to fulfill a number of conditions for the loan extended two years ago. For instance, it failed to establish an agency of financing for state programs, and while the agency on privatization was established, it stopped short of privatizing anything. Moreover, just before the 2010 presidential elections, the government has dramatically raised salaries to woo the electorate. Apart from that, the IMF usually imposes caps on the amounts a country can borrow in accordance with the country's quota. Belarus has already used its quota. In 2008, following extension of the US $2.46 loan to Belarus the IMF Managing Director Dominique Strauss-Kahn noted that the access the country was granted to its resources in the amount of 420% of the quota was unprecedented. However, Belorusski Rynok noted that the IMF was a flexible institution and may extend funds beyond the quota of Belarus. The political component in the IMF's future decision also needs an explanation. The United States and the European Union heavily criticize the Belarus government for its human rights violations. Both introduced sanctions against Belarus, although the European Union stopped short of serious economic sanctions. They insist that Belarus should stop repression against the opposition and release political prisoners before discussing any financial aid. Belarusian weekly Nasha Niva quoted an anonymous European diplomat in Minsk, according to whom Belarus authorities were sending inconsistent signals, both in politics and economics. As an example, he mentioned Lukashenka's statement that political prisoners would soon be released. However, following that statement two former presidential candidates – Mikola Statkevich and Dzmitry Uss were sentenced to long prison sentences. The diplomat also recalled new restrictions on media, and the threat to close two leading opposition newspapers – Narodnaya Volya and Nasha Niva. According to him, if the situation remains the same, the European Union will continue to ignore any overtures made by the Belarusian authorities. As far as the economic situation in Belarus is concerned, he had the impression that Belarusian authorities are doing nothing to change the course of events. The government negotiates a possible loan with the IMF, but decisions are not being made by the government. Although the West dislikes Lukashenka and his policies, they are also concerned about the increasing role of Russia, which continues to build up pressure against Lukashenka. This week, the Russian energy state-owned giant "Inter RAO EES" halved its supplies of electricity to Belarus. The reason was the debt of Belarus in terms of energy supplied in March-April of this year. The Russian Ambassador to Belarus, Alexander Surikov stated this week that the main reason for the economic crises in Belarus was the change of the terms of Russian oil supply with Belarus. Between 1995 and 2007 Belarus did not have to share the export duty on refined oil products with Russia. Starting in 2007, it had to share with Russia, which "caused a hole" in the Belarusian budget. Surikov noted that the government needed to correctly develop a program to combat the crises, secure external finances, privatize state property and reduce imports. According to him, it was time to understand that Belarus economy can no longer afford the level of spending it had in the past. The Financial Times proposed in its editorial to extend an IMF loan to Belarus because that would help the country reduce the threat of placing Belarus irreversibly in Russia’s geostrategic and economic orbit. This would reduce the independence of Belarus to a cipher and set a disturbing precedent for other former Soviet republics. The editorial concluded that an IMF program, properly designed and implemented, would contribute to the goal of free and independent Belarus. Others consider that providing an IMF loan to Lukashenka means prolonging the existence of the Belarus regime. This year the official Minsk faces pressure which it has never seen before and is closer to collapse then ever. Providing help to it today would mean to waste the momentum. Moreover, in the past not only did Belarus not comply with recommendations of the IMF it failed to implement any significant reforms and has largely "eaten up" the loans. It appears that for the long-term development of Belarus privatization of enterprises is highly desirable. That would help attract the badly needed foreign investments and make state enterprises more efficient. However, Western investors worry about political risks in Belarus and the instability of its legal and political system. Russian investors, on the other hand, have enough financial resources and hope that the Kremlin could protect their interests. Even if the state enterprises are sold to Russian business groups, Belarus will be able to tax and otherwise regulate those enterprises and even expropriate, if necessary. In the future, the same enterprises can be sold by the Russian investors back to the state or to Western investors. However, privatization by the Russian capital has two potential downsides. First, the privatization process will not be transparent. A significant share of the proceeds of sales of large enterprises will end up with corrupt Belarusian and Russian bureaucrats. Second, early 1990s showed that Russian investors tend to loot assets instead of thinking long-term. The situation in Belarus today in many respects resembles the early 1990s, which may prompt Russian businesses to behave as before. Another downside of inviting Russian investors is that it will further strengthen Belarus' dependence on Moscow. Also, Russian privatization in the early 1990s demonstrated that it was better to invite investors with superior technologies and management skills rather then selling to the locals. However, because the demand for the external financing is so great, it appears inevitable that Russian businesses will take over many Belarusian state enterprises. And even the IMF loan will not help the Belarusian authorities to keep its state-owned property. Once the structure of the economy is changed, Belarus will no longer be the same.